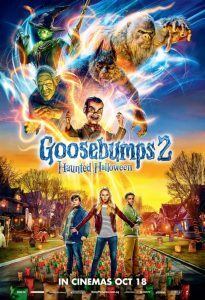 While adults are treated (or perhaps tricked) to a remake of Halloween this time of year, younger audiences also get another recycling of a tried and true formula in Goosebumps 2: Haunted Halloween. With a new batch of humans, the same group of monsters return with a few new additions, making for an entertaining enough comedy-horror for kids and teens. Sarah (Madison Iseman) is busy preparing college applications when she is tasked with babysitting her younger teenage brother Sonny (Jeremy Ray Taylor) and his friend Sam (Caleel Harris). While cleaning out an old abandoned house, Sonny and Sam come across a locked book and key, and subsequently a ventriloquist dummy named Slappy. Before long Slappy has come to life and is causing mayhem at home and school while the boys and Sarah officially freak the hell out. Soon Slappy has released all of R.L. Stine’s monsters back into the real world, as well as bringing all of the neighbourhood’s Halloween decorations to life. The three teens venture to find Slappy, return the characters to the book, and live to fight another day. While the second instalment recycles much from the first in terms of story, director Ari Sandel and screenwriter Rob Lieber’s film is altogether an improvement on the first. Despite Jack Black’s role as R.L. Stine being reduced to hardly more than a cameo, the remainder of the cast is much stronger than that of the first film, with all three teens terrific. The lame as hell love story from the first is gone; there’s nothing more than a brief relationship that crumbles early this time around, and the film is all the better for it. There’s no “doing it for the girl” – in fact, it’s the girl doing most of it – and the film is more concerned with family and to a lesser extent, following academic dreams. Most pleasingly the film is actually funny. A scene summarised best as “When gummy bears attack” is a clear highlight. Sugar kills, after all. When Jack Black does show up he’s as wonderful as ever; when he comes face to face with the mayhem he delivers some of the film’s best lines. Slappy is the main star of the show this time (unlike last time he is not voiced by Black but Mick Wingert) and he is both creepy AF and hilarious all at once. The remaining monsters aren’t particularly interesting but those gummy bears make up for it. The Goosebumps franchise is not for young kids (no really, they will have nightmares) but should keep older kids and younger teens entertained this Halloween. As for parents who wind up sitting through this offering, you could do better but you could also certainly do worse. This review was first published on 24th October at Film Blerg.